Chief Inspector Roy Hodder, of Sussex Police. POLICE chiefs have apologised for failing to keep the family of a missing special forces veteran, who later killed himself, properly informed about their efforts to find him. Sussex Police has vowed to overhaul its support for relatives of missing people after top officers admitted failings in the hunt for Danny Johnston. The admission came during the inquest into Mr Johnston’s death, held at West Sussex Coroner’s Court, in Crawley. 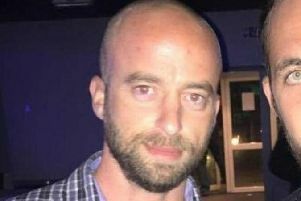 Mr Johnson, 35, of Bognor Regis, had been missing for four days when his body was found hanging from a tree in Stoughton Woods, near Chichester, on May 23. Mr Johnson’s mother, Viv Johnston told the court her family had ‘been let down’ by police and has previously been critical of how the force conducted its search for her son. Now Chief Inspector Roy Hodder insisted Sussex Police was doing all it could to overhaul things and that new measures had already been introduced. He told the court top officers within the force were conducting a review which would create a new ‘bespoke service’ to support families. The scheme would be similar to the support offered to victims of crime and would provide families with a single, dedicated point of contact. Ch Insp Hodder hoped this would give worried loved ones ‘timely updates’ about future searches. Detective Sergeant Alan Fenn, who was part of the investigation in the wake of Mr Johnston’s death, admitted the force could have done better during the search. He said: ‘There needs to be a more consistent approach to contact, especially for a high-risk missing person investigations. ‘There was an awful lot of work being done by Sussex Police to try and find Danny. ‘There could have been improvements in the way that was being communicated. The family wasn’t aware at the time how much was being done.